Katharine Meyer Graham, the renowned American publisher of the Washington Post, once shared, “No one can avoid aging, but aging productively is something else.” Indeed, old age is an inevitable phase we all go through. There is no way you can stop the clock. Exercising regularly offers plenty of health benefits. Engaging in aerobic exercises for even at least thirty minutes a day can help strengthen your heart, as well as improve your figure, mood, and mental ability. 2. Be picky about the foods you consume. Nutrition plays a vital role in your aging process. Make sure that you maintain a healthy and well-balanced diet. Include fruits, vegetables, whole grains, and lean protein in your diet. 3. Eat in right proportions. Aside from watching what you eat, you should also watch how much you eat. Overeating can have negative effects on how your body handles the aging process. It can lead to diabetes and cardiovascular disease. 4. Leave bad habits behind. Smoking and drinking will not do any good to your health. It is time to quit these bad vices. If you want to drink alcohol, limit it to no more than one drink a day. Not getting enough sleep can put you at risk for physical and mental problems. So be sure that you get at least seven hours of sleep a night. Do not keep old age from hanging out with your family and friends. In a study published in the journal of PLos Medicine, it showed that people who have strong social ties have a fifty percent higher chance of living longer than those with poor social relationships. 7. Do not be afraid of failures. Same with growing old, failing is also inescapable. This is not something you should be worried about for it serves as an incredible path towards growth. Research even suggests that failing is a sign of a well-lived life. 8. Keep a positive attitude. A famous quote by Napoleon Hill goes, “Whatever the mind can conceive and believe, it can achieve.” Think of aging as a positive thing. One study shows that elders who think of old age as a means to wisdom and overall satisfaction are more likely to recover from a disability than those who associate it with helplessness or uselessness. Stress can make you appear older than your actual age. While stress is unavoidable, you can find ways on how to deal with it. Aging is attributed to many changes, not only physical changes but also emotional and mental changes. Instead of seeing these changes as deviant crises, learn to embrace them. 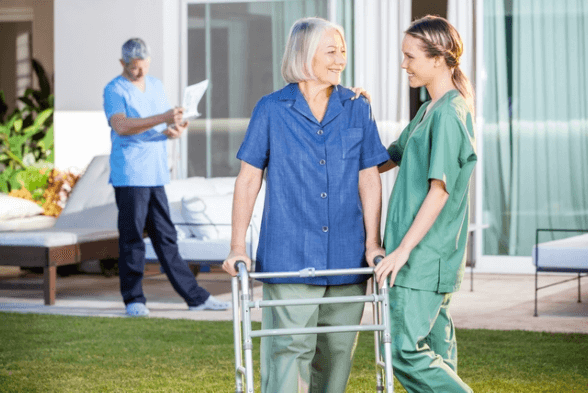 For a reputable Non-Medical Home Care in Opitz Boulevard, Woodbridge, VA, give OptimumCare Home Care Services a thought. Contact 703-490-8003. This entry was posted in Non-medical home care and tagged graceful aging, Home Care in VA, home healthcare, Non-medical home care. Bookmark the permalink.